Definition at line 68 of file llcallingcard.cpp. Definition at line 722 of file llcallingcard.cpp. References COARSE_FREQUENCY, FIND_FREQUENCY, mAgentGone, mCoarseLocationTimer, mName, mUpdateTimer, OFFLINE_SECONDS, and LLTimer::setTimerExpirySec(). Definition at line 736 of file llcallingcard.cpp. References llendl, llwarns, mAgentGone, mAvatarID, mGlobalPositionEstimate, mHaveInfo, OFFLINE_SECONDS, and LLTimer::setTimerExpirySec(). Definition at line 749 of file llcallingcard.cpp. References LLTimer::checkExpirationAndReset(), COARSE_FREQUENCY, FIND_FREQUENCY, LLAvatarTracker::findAgent(), LLViewerObjectList::findObject(), gObjectList, LLAvatarTracker::instance(), LLViewerObject::isDead(), mAgentGone, mAvatarID, mCoarseLocationTimer, mHaveCoarseInfo, mHaveInfo, mUpdateTimer, OFFLINE_SECONDS, and LLTimer::setTimerExpirySec(). Definition at line 781 of file llcallingcard.cpp. References COARSE_FREQUENCY, mCoarseLocationTimer, mGlobalPositionEstimate, mHaveCoarseInfo, mHaveInfo, and LLTimer::setTimerExpirySec(). Definition at line 85 of file llcallingcard.cpp. Referenced by agentFound(), haveTrackingInfo(), and LLTrackingData(). Definition at line 78 of file llcallingcard.cpp. Referenced by agentFound(), LLAvatarTracker::findAgent(), LLAvatarTracker::getAvatarID(), LLAvatarTracker::getDegreesAndDist(), LLAvatarTracker::getGlobalPos(), haveTrackingInfo(), LLAvatarTracker::processNotify(), and LLAvatarTracker::untrack(). Definition at line 83 of file llcallingcard.cpp. Referenced by haveTrackingInfo(), LLTrackingData(), and setTrackedCoarseLocation(). Definition at line 80 of file llcallingcard.cpp. Referenced by agentFound(), LLAvatarTracker::getDegreesAndDist(), LLAvatarTracker::getGlobalPos(), and setTrackedCoarseLocation(). Definition at line 82 of file llcallingcard.cpp. Referenced by haveTrackingInfo(), and setTrackedCoarseLocation(). Definition at line 81 of file llcallingcard.cpp. Referenced by agentFound(), haveTrackingInfo(), and setTrackedCoarseLocation(). Definition at line 79 of file llcallingcard.cpp. 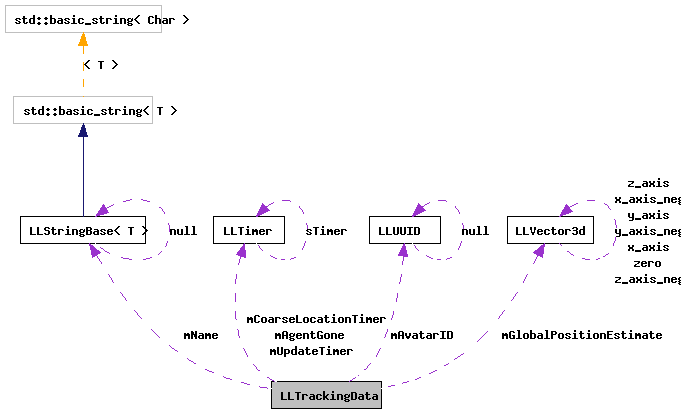 Referenced by LLAvatarTracker::getName(), and LLTrackingData(). Definition at line 84 of file llcallingcard.cpp. Referenced by haveTrackingInfo(), and LLTrackingData().